2) The sales presentation slides detract from your customer message. That’s why we focus extensively on these two areas. 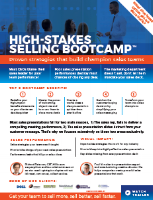 Email Paul to discuss of customized High-Stakes Selling Bootcamp for your team. Start the discussion with no strings attached. We won’t add you to any email list. We promise! Just a discussion. Thank you! I will get right back to you. If you want to schedule a quick call, click this link!